The river here is tidal and runs from the iron bridge at Bigsweir, down to where the Wye joins the Severn. Below Bigsweir the river wraps itself around the curves of steeply wooded hills, with occasional breaks for the small fields which are so typical of this area. At Brockweir another iron bridge crosses over, which is generally regarded as picturesque. But not to all. A. Dorothy Holmes, a local author writing in 1939 said ” If Health Robinson has been asked to think up some hideousity by which one could cross from one side of the river to the other this is just what he might have produced as a joke”. She was just as upset by the next bridge downstream, the Tintern ‘Wireworks’ bridge built to connect industry on the west of the river to the Wye Valley Railway on the east. Below Tintern the river runs through a gorge, with sheer cliffs breaking through the carpet of decidous trees. The best known cliffs are Wintour’s leap on the English bank ( Sir John Wintour, a royalist, was supposed to have escaped from his pursuers by leaping on horseback into the river); and those below the Eagle’s nest on the Welsh side. 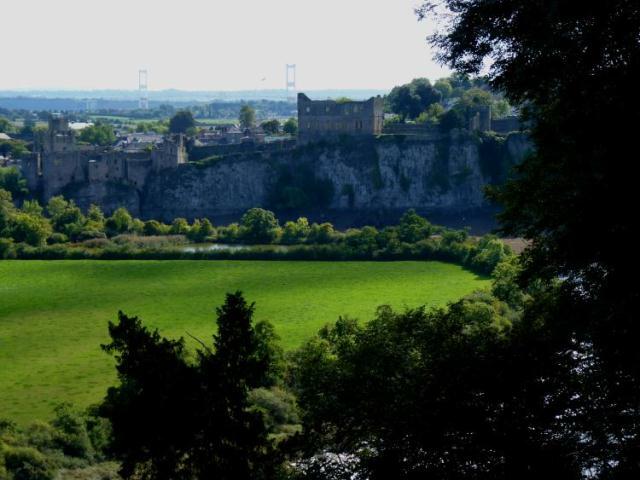 The grand finale for the Wye is the awe inspiring site of towering cliffs merging into the ancient walls of Chepstow castle. In the last mile or so, rather sadly, the Wye seems to lose its spirit and sink into despondency, weighed down by the mudflats, and fading against the splendour of the Severn’s estuary. Monmouthshire County council provide information on short walks in this stretch of the Wye Valley and surrounding areas, and so does the Forest of Dean Tourist Information service (www.royalforestofdean.info/walking.shtml). In 2012 Chepstow became an official ‘Walkers are Welcome’ town – very fitting since it is either the beginning or end of both the Offa’s Dyke path and the new (2012) Wales Coast path. The associated Walks in Chepstow website provides plenty of local information, as well as ideas for local walks, charity walks and dog friendly walks. The long distance Wye Valley walk also has more detailed information, including on the Chepstow to Monmouth section.